back into print, adding a response to each chapter by a wellknown contemporary author such as Jim Wallis, Tony Camplo, Cornel West, Richard Rorty, Stanley Hauerwas, and others. Between 1886 and 1897, he was pastor of the Second German Baptist Church in the "Hell's Kitchen" area of New York City, an area of extreme poverty. As he witnessed massive economic insecurity, he began to believe that Christianity must address the physical as well as the spiritual needs of humankind. Rauschenbusch saw it as his duty as a minister and student of Christ to act with love by trying to improve social conditions. This, in fact, inspired leaders such as Reinhold and Richard Niebuhr, Rev. Martin Luther King, Jr., Mahatma Ghandi and Bishop Desmond Tutu. "Christianity is in its nature revolutionary" Rauschenbusch wrote, and the significance of his work is that it spoke of society's responsibility to the poor and downtrodden. 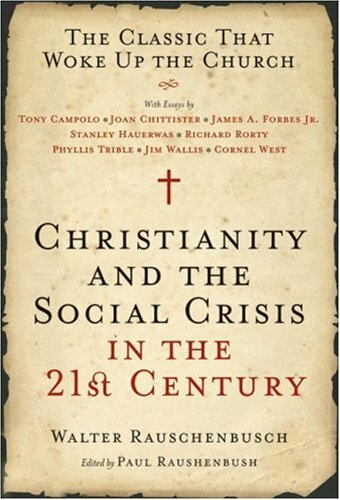 In the present atmosphere of heightened debate and even antagonism between political and religious viewpoints Christianity and the Social Crisis will again be a book that will provoke intense responses by people on every side. As the disparity between the rich and the poor in America continues to widen in the 21st century, the book's explication of the radical social message of Jesus is as applicable today as it was 100 years ago.